This has been an exciting and exceptionally busy year for me. I began to work part time at a local slaughterhouse in Spring Mills, Rising Spring Meat Co. Through meeting their customers, I came in contact with the chefs at the Nittany Lion Inn, who asked me to come in occasionally to help launch an in-house sausage making program for the restaurant. While finishing up my second day at the Nittany Lion Inn, one of the chefs mentioned they would be ordering half of a Bison through RSMC. He asked my thought on fresh beef sausages, not semi-cured products like summer sausage. Bison always make me think of the west, so I talked about chipotle pepper, mesquite smoke, etc. The chef came back with the totally wild idea of using hops and toasted wheat, which would give the bison meat an interesting beer flavor profile. Since then, I've been thinking about using hops to season meat. While I've seen fresh hops used in dishes (most notably Sierra Nevada's hop harvest celebration of a whole pig fed on spent grains, then butchered and stuffed with fresh hops prior to roasting), I'm doubtful fresh hops could be reliably used in a product like this bison sausage. Fresh hops aren't harvest till the fall, plus Pennsylvania isn't abundant with hop farms, so the supply would be spotty at best. But what about making an extract of hops? There are some commercial versions on the market, but I was curious about making my own. At first I thought about a hop-infused vinegar, but vinegar is usually avoided in sausage making. Vinegar has a tendency to make sausages "crumbly." The only major exception to this vinegar rule is Mexican chorizo sausage, but that's normally used crumbled up and cooked as a component of a larger dish, so no loss there. Instead of vinegar, I thought of an alcohol infusion. It seemed perfect, so I went ahead as if I was making my own vanilla extract, but used hops instead of vanilla beans. I packed an old amaro bottle full of dried cascade hops and then filled it with vodka. 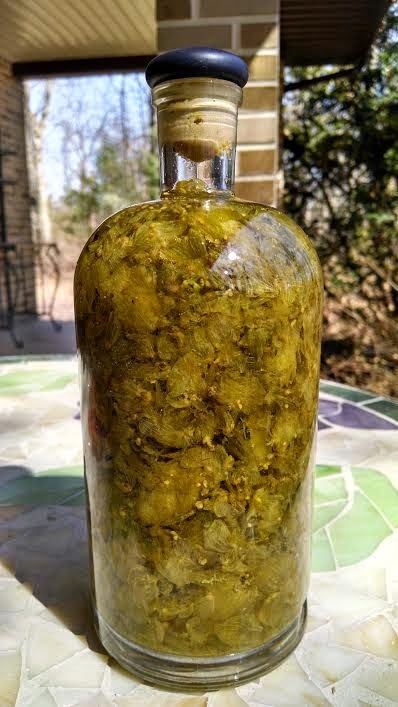 The dried hops slowly soaked up the liquor and seemed to "bloom" in the bottle. But why not just use an IPA or other super hoppy beer? For one, I'd prefer to avoid adding a lot of extra liquid to the sausage. This would allow me to use a smaller, but concentrated amount of hops. Plus, so many beers are a blend of hops, which can be piney and resinous, citrusy and grapefruity, or just plain coarse and bitter. By making single-hop infusions, that puts more control in my hands. I'd like to let this infuse for a week before trying it. I'm not quite sure how much to use to start, but there is some historical precedent to draw on. Using bitter herbs in sausages was actually quite common, when it was a component of what was called "herbal pepper." Since pepper is not native to Europe, it could become very expensive, or totally nonexistent during wartime. In Poland they used herbal pepper often, which was a blend of dried horseradish, white mustard seed, and a small amount of a very bitter herb called gentian. I've actually thought about growing some gentiana flowers to harvest the gentian root, but using hops may be the perfect substitute. So I'll use the old Polish proportions to help guide my initial recipes.